Gene Turner photograhed above by his daughter as he flew the Mariah prototype. AAC is proud to make available once again after a 20+ year absence, the Gene Turner designed T-100D Mariah ultralight. It is exciting and an honor for us to support Mariah and to breathe new life into this design. Mariah was designed by Gene to meet or exceed FAA FAR Part 23 airworthiness standards, standards to which “true airplanes” are built in the USA. Mariah is an ultralight designed under the same standards that Cessna and others use to design their certified airplanes. Gene as an aeronautical engineer, designed aircraft to meet or exceed Part 23 standards, his design approach to Mariah was no different from any other aircraft that he designed even though Mariah was to be an ultralight air vehicle. 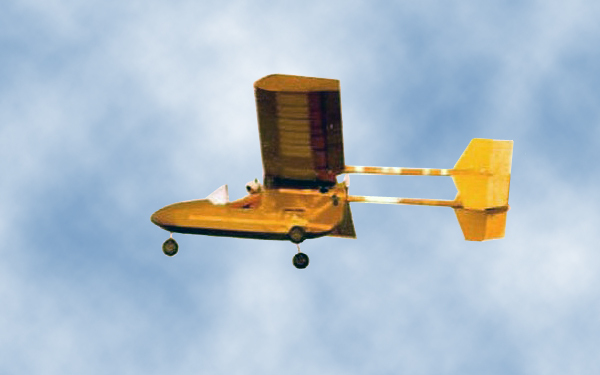 Mariah was one of the first "airplane” style ultralights in that it was not a hang glider with an engine attached, it does not have single surface wings, it does have a cockpit enclosure, and employs three axis controls rather than spoilers that were common at that time in Ultralight development. Mariah is a true ultralight and qualifies under the US FAA FAR Part 103 regulations. It is a high-wing design, has twin tail booms and tails, steel tube landing gear, and a pod type fuselage. The prototype used a 20 hp Cuyuna 215 engine in a pusher configuration as the power plant. Construction is of wood (Spruce or Douglas Fir), steel for landing gear, some fiberglass parts, birch plywood, and fabric cover. The plans consist of 26 pages of "D" size (2' x 3') sheets of detailed drawings and information, 16 pages of Bill of Material (BOM) information printed on 11" x 17" paper, and a construction and information manual. The plan sets will be shipped out insured, rolled rather than folded, and placed in a shipping tube for protection. We do not charge a handling fee, the shipping price is the cost required to send the plans. You may use personal checks (must clear both banks), US Postal Money Order, Certified Check, or Cashiers Check for payment purposes. Note: Georgia residents must add 7% sales tax. We examined the drawings and found that all but 5 of the pages could be reduced down to 11" x 17" in size allowing for a savings in printing costs. 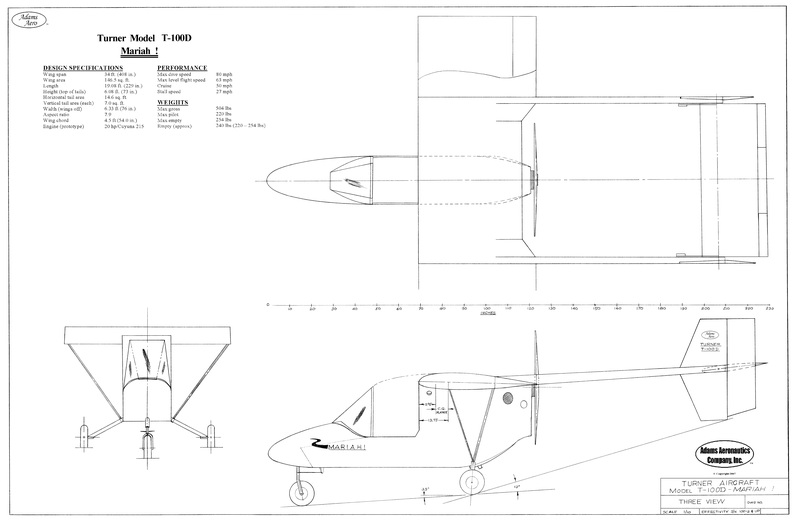 The most crucial drawings such as wing ribs, center section ribs and the horizontal tail assembly remain the full 24" x 36" size. The other drawings have the dimensions listed and full size templates can be drawn by the builder. Since this is a reduced size set, more work will be required by the builder. However, you will realize a savings of $100.00 off the cost of the full size plans. If you want or need a particular drawing or drawings printed full size, we would be happy to accommodate you. Any of the additional sheets can be purchased by our plans set serial number holders for $10.00 per sheet plus shipping. copies so each page is crisp, clear and easy to read. The reduced size plan sets will be shipped out insured and placed in a shipping envelope for protection. We do not charge a handling fee, the shipping price is the cost required to send the plans. You may use personal checks (must clear both banks), US Postal Money Order, Certified Check, or Cashiers Check for payment purposes. Note: Georgia residents must add 7% sales tax. 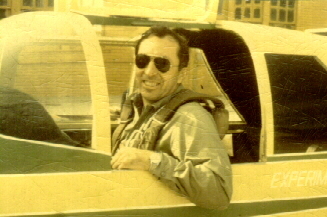 Gene after first flight of his Turner T-40A/B at Mojave Airport, 1969. Gene Turner, the designer of the T-100D Mariah has had a passion for aviation ever since he was a young boy and that passion still burns strong within him today. In fact, he is still an Authorized Flight Instructor, Aeronautical Engineer, A&P Mechanic, Author, and Publisher. During WWII, Gene enlisted in the US Army Air Corps as an Aviation Cadet and graduated as a full fledged P-47 Fighter Pilot. After the war, he taught flight instruction in southern Michigan. In 1951, he graduated from the Aeronautical University with a degree in aeronautical engineering. He went on to have an exemplary aviation career in both government and private sectors, as well as owning and operating his own aircraft company, Turner Aircraft, Inc. In 1962, Gene won 2nd place with his original design T-40 aircraft, N115ET, in the Experimental Aircraft Association's (EAA) design competition for a folding wing airplane. (See EAA's Sport Aviation Magazine, July 1965 for details.) He further developed this design into the ever popular 2 seat T-40A series and this design has enjoyed much popularity over the years. Gene's original T-40 which he named Ophelia Bumps, is now retired and on display at the Saxon Aerospace Museum in Boron, California where Gene is active as a Docent. In 1982, Turner Aircraft, Inc. ventured into the ultralight aircraft arena with the Model T-100 aircraft Gene called Mariah. Gene saw the need for a light weight airplane designed to meet the needs of pilots who wanted to fly, but did not have an FAA flight physical or who could not afford to fly certificated airplanes. With this criteria defined, the idea for Mariah was developed and implemented in the T-100 series of ultralight aircraft. 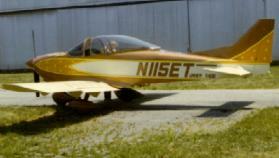 Visit Gene's web site by clicking on the T-40 airplane picture below to see what he is working on now. Also, we highly recommend buying a copy of his book "Fabulous Affairs With Aircraft and Federal Aviation Airheads". Click on the book icon below to go directly to the information page. Source: Personal conversations and e-mail with Gene Turner, his web site, and his book.